Market volatility in late August and September is driving Affluent investors back to the investment sidelines, according to Specrem Group’s latest investment preferences survey. Affluent investors overall who indicated a reluctance to invest in the coming month rose 4.55 points from August to a 10-month high. In September, the stock market fell sharply for the second consecutive month. The S&P 500 closed the month at 1920.03, down 2.47 percent. The markets were roiled in August by concerns over the slowdown of China’s economy. On Aug, 24, the Dow suffered an historic 1,000-point decline before closing with a loss of nearly 600 points. It was the worst day for the Dow since August 2011. The reverberations could still be felt in September. Intention to invest in Stocks and Stock Mutual Funds in the coming month was basically unchanged from August, but Cash declined 5.54 points to its lowest reading in half a year. Intention to invest in Bond Mutual Funds dropped 2.35 pts. to a four-month low. 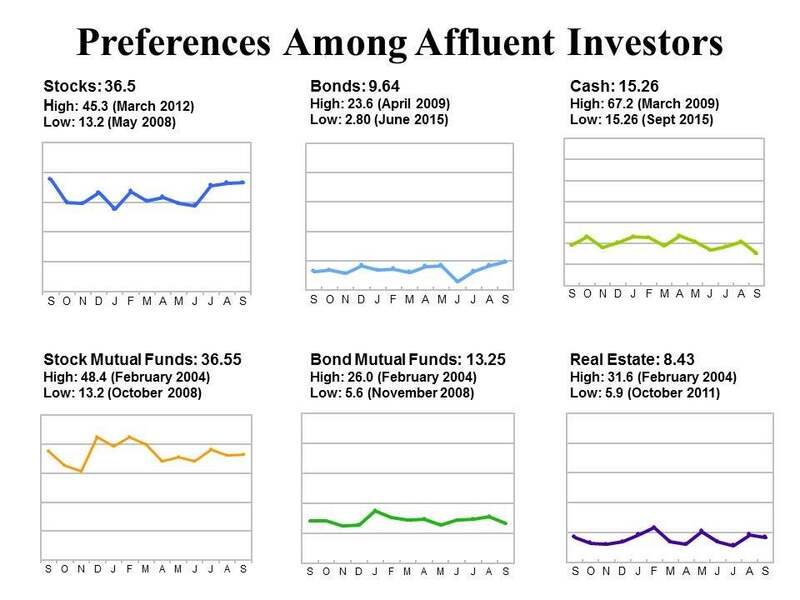 Spectrem Group analyzes Affluent investment preferences by Millionaire and non-Millionaire households. Interestingly, September saw an attitude switch between Millionaire investors, who are generally more active and confident investors, and their non-Millionaire counterparts. While Millionaires indicated they would not invest in Stocks in the coming month (a 3.7-pts. decline from the previous month), non-Millionaires indicated an increase in their intention to invest in equities (up 5.6 pts). Millionaire investors indicating they do not intend to invest in the short term jumped 6.2 pts, compared with a 0.6 of a point gain among non-Millionaire respondents. Year-over-year, however, this represents a 4.1 point decline for Millionaires, but a nearly 12-point increase for non-Millionaires. There was a near-equal drop among both Millionaires and non-Millionaires in their intention to invest in Cash in the coming month, 6 points for Millionaires and 4.8 pts. for non-Millionaires. There was an uptick among Millionaires to invest in more conservative Bonds (1 pt., a four-month high). Intention among non-Millionaire investors to invest in Bonds rose 1.9 pts., a 16-month high).